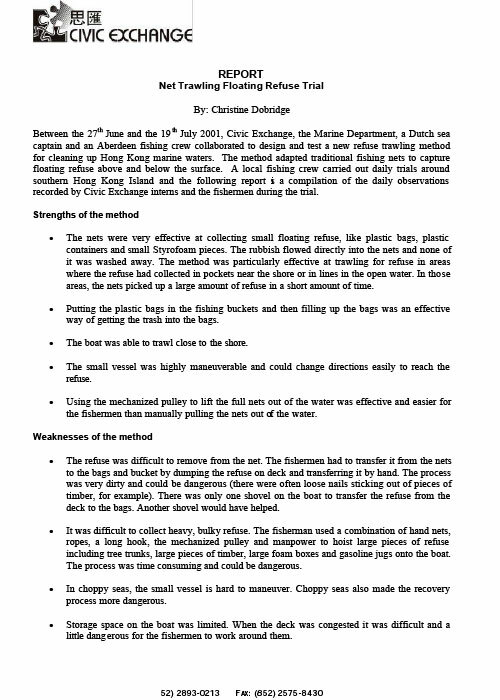 Between 27 June and 19 July 2001, Civic Exchange, the Marine Department, a Dutch sea captain and an Aberdeen fishing crew collaborated to design and test a new refuse trawling method for cleaning up Hong Kong marine waters. The method adapted traditional fishing nets to capture floating refuse above and below the surface. A local fishing crew carried out daily trials around southern Hong Kong Island. This report is a compilation of the daily observations recorded by Civic Exchange interns and the fishermen during the trial.